Disclaimer: This post intends to educate the reader about how to prepare a tasty and nutritious, if undervalued food item. It does not intend to promote unsustainable/unethical farming practices or one particular diet over another. How do you get a super-tender, medium-rare steak that is both healthy and budget-friendly? Make it with heart! Heart meat is low in fat and contains more vitamins and minerals than any other cut of muscle meat. It is truly a super-food from the animal kingdom. But what really makes it stand out is its culinary potential – due to its outstanding tenderness and rich, meaty taste. Why eat heart, in the first place? It is absolutely delicious – tender, tasty and versatile. 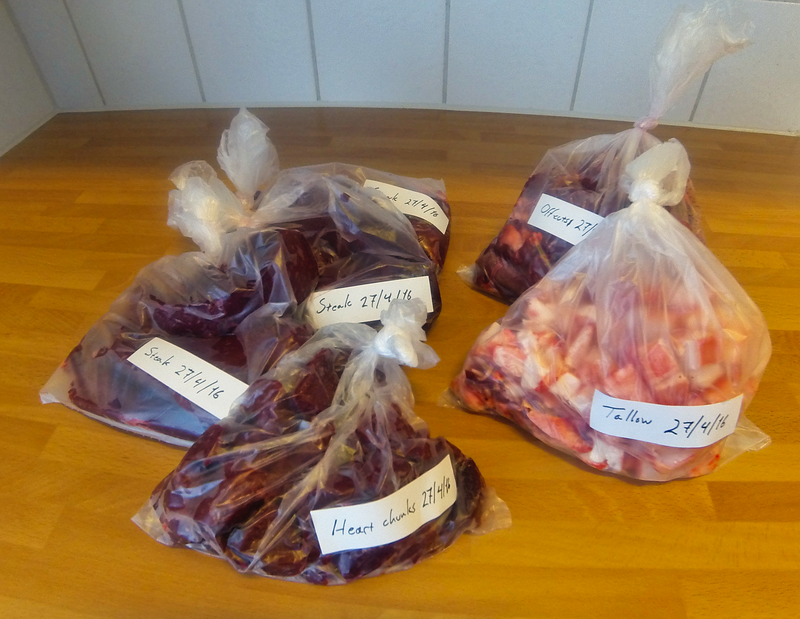 Parts obtained from a 2.5 KG beef heart – enough meat for at least 5-6 meals. We grill or slow-cook the “steaks” and chunks. We render down the tallow (the hard, white fat) and use it for cooking or crafts. The left over “offcuts” we use for beef stock. My spouse and I buy beef heart at least once a month. We butcher and package it at home, then freeze what we won’t be using immediately. That way we always have some good meat at hand, no matter what our budget or schedule looks like. Sourcing good quality heart is like sourcing any good meat. Get it from a reputable butcher who can make sure it comes from a healthy, happy animal. Ensure that it is a deep, healthy red colour and smells like fresh meat – if it is pale or smells funny, don’t buy it. If you are not used to butchering your own meat, get a large beef heart (or ask your butcher to prepare it for you). The bigger the heart, the easier it will be to work with. Heart requires gentle cooking to give you amazingly tender, flavourful meat. Otherwise, you will get meat that is tough as old boots. Fresh beef heart can be used for steak tartare or carpaccio. There are so many great ways to cook heart meat! You can substitute heart meat for regular meat in many recipes – including fajitas, stir-fries, stroganoff, curries and stews. You can even use it for carpaccio and steak tartare. My favorite way to cook it is to pan-grill heart “steaks”. The process is simple and the steaks can be served in a number of ways – try it with baked sweet potato, served with bread as a steak sandwich or top a bowl of leafy greens for a crunchy steak salad. Heat up the grill pan with your stove on the highest setting. Add freshly ground pepper and rosemary to one side of your heart steak. When the pan is hot, gently add the steak, peppered side down. Add freshly ground pepper and rosemary to the top of your steak and flip the steak over. Put a lid on the grill pan and immediately turn the stove down to the lowest, or second-lowest setting. Grill until the meat begins to look evenly browned (around 3-5 minutes). Take off the lid, flip the steak and add the red wine. Return the lid and allow to cook for another 5 minutes. By now the meat juice should be mostly clear. It may still be red in a few areas – that’s ok. Flip the steak one last time and set the entire grill pan aside for 5-10 minutes. This allows the meat to finish cooking and rest. Transfer the steak to a cutting board and slice into 1cm (1/4-inch) pieces. The meat should be pink inside, but brown close to the edges (see the photo of pan-grilled heart steak in the gallery below). Serve with root vegetables, rice, bread or salad. Enjoy! Parts obtained from a 2.5 KG beef heart. The “steaks” and chunks are cooked like any other meat. The tallow is rendered down and used for cooking or crafts. The left over “offcuts” are used to make beef stock. Fresh heart meat ready for the grill. Pan-grilled heart steak served with mashed potatoes and tomatoes. A simple, yet delicious dish, costing around €1 per serving. Stuffed, rolled heart steak with rice, coconut milk and spinach. Stuffed calf’s heart with broad beans.